In darkness and daylight, on dirt roads and multi-lane highways, from warm spring days to frigid winters, Minnesota school bus drivers safely transport more than 760,000 students to and from school each day. 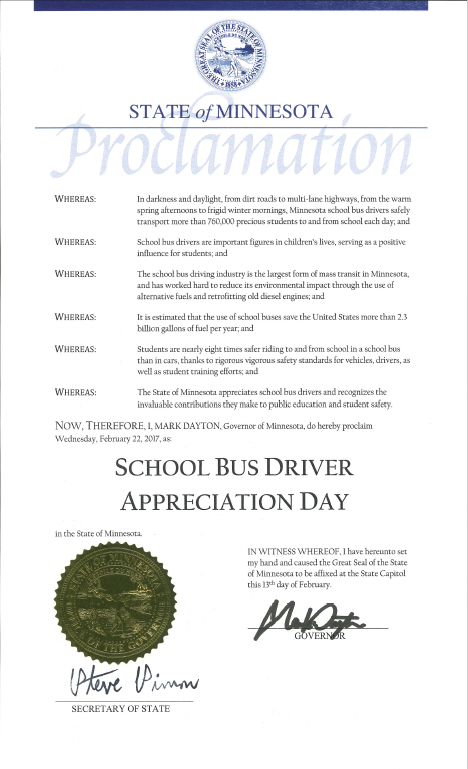 To recognize this important profession, Wednesday, February 22, has been proclaimed by Governor Mark Dayton the first-ever statewide celebration of School Bus Driver Appreciation Day in Minnesota. 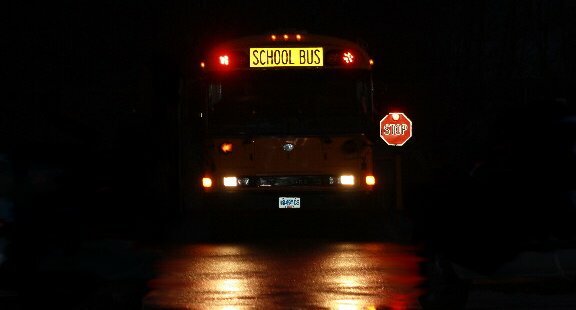 This entry was posted in Operating a School Bus, School Bus Drivers and tagged School Bus Drivers, student transportation on February 22, 2017 by mnschoolbuses. It may be 40 in February, but we’re not out of the woods yet! As the weather does it’s rollercoaster of hot and cold, we can forget what to do when the weather turns for the worst. Our winter driving skills can get lost if we don’t use them often, but we can never forget these few tips. Prepare your vehicle. All too often you will see a car driving down the street with snow covered windows and windshield. I always wonder how much of the road and other cars they can see. Making sure your vehicle is safe to drive is one of the most important aspects of driving. Check your headlights, taillights, tire pressure and wipers. Always make sure before you pull out of your driveway or away from your home that your vehicle is in good working order. It is okay to leave early. When the weather is uncertain so will be the traffic. Check the weather report the night before. Be aware of your route to work or school. Is it on a clear day a high traffic area? Diminish the risk of crash or being late by choosing to leave earlier, or using an alternate route. Slow down! The faster you are traveling, the longer/further it will take you to slow down or come to a complete stop. If the road is wet or icy, you must allow your vehicle time and space to stop safely. Increase your following distance. This goes hand in hand with driving slower. If it is going to take you longer to stop due to the speed your vehicle is going, then you must also have room. In icy or wet road conditions you should increase your following distance to 4-6 seconds, leaving a space cushion between you and the vehicle in front of you. Always be aware of your surroundings. Keep your eyes open for emergency vehicles and snow plows. Stay back from them 300 feet or more. Snow plows can create visibility issues and emergency vehicles can make sudden turns or lane changes. Don’t be in a hurry. Black Ice. If the ground looks wet, think Slippery. At intersections, overpasses and bridges black ice can collect and become very dangerous to drive on. These areas can be slippery even when other parts of the road are not. Decrease your speed when approaching intersections and slow down before coming into a curve in the road or going over/under any bridge. If you are using these tips in your daily winter driving, you are giving yourself a fighting chance on surviving winter. Winter is hard enough to get through. It’s cold, dark and can stretch out over 4 months out of the year. Make your days smoother by getting there safely. This entry was posted in Safe Driving Tips and tagged icy roads, school bus safety, snow, snow plows, winter driving on February 6, 2017 by mnschoolbuses.